air drainage (gravity induced, downslope flow of relatively cold air) may be enough to prevent fog formation, or a sudden shift in the wind direction may cause fog to cover an airfield. The temperature to which air must be cooled, at a constant pressure and a constant water vapor content, in order for saturation to occur is the dew point. This is a variable, based upon the amount of water vapor present in the atmosphere. The more water vapor present, the higher the dew point. Thus, the dew point is really an index of the amount of water vapor present in the air at a given pressure. Temperature and dew point may be made to coincide either by raising the dew point until it equals the temperature of by lowering the temperature to the dew point. The former results from the addition of water vapor to the air by evaporation from water surfaces, wet ground, or rain falling through the air. The latter results from the cooling of the air by contact with a cold surface underneath. There are several classifications of fog: radiation fog, advection fog, upslope fog, and frontal fog. RADIATION FOG.Radiation fog, which generally occurs as ground fog, is caused by the radiation cooling of Earths surface. It is primarily a nighttime occurrence, but it often begins to form in the late afternoon and may not dissipate until well after sunrise. It never forms over a water surface. 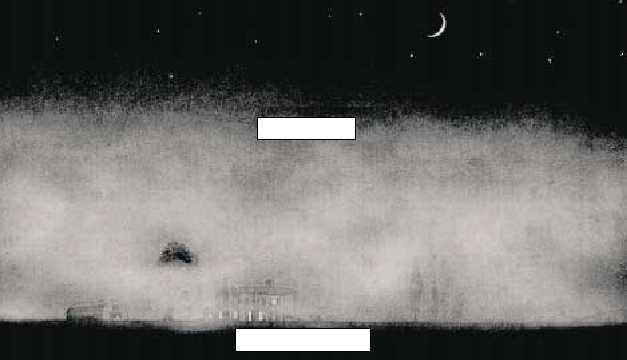 Radiation fog usually covers a wide area. After sunset, Earth receives no heat from the Sun, but its surface continues to reradiate heat. The surface begins to cool because of this heat loss. As Earth cools, the layer of air adjacent to the surface is cooled by conduction (the transfer of heat from warmer to colder matter by contact). This causes the layer near Earth to be cooler than the air immediately above it, a condition called an inversion. If the air beneath the inversion layer is sufficiently moist and cools to its dew point, fog forms. (See fig. 5-2.) In case of a calm wind, this cooling by conduction affects only a very shallow layer (a few inches deep), since air is a poor conductor of heat. Wind of low speed (3 to 5 knots) causes slight, turbulent currents. This turbulence is enough to spread the fog through deeper layers. As the nocturnal cooling continues, the air temperature drops further, more moisture is condensed, and the fog becomes deeper and denser. If winds increase to 5 to 10 knots, the fog will usually thicken vertically. Winds greater than 10 knots usually result in the formation of low scud, stratus, or stratocumulus. After the Sun rises, Earth is heated. Radiation from the warming surface heats the lower air, causing evaporation of the lower part of the fog, thereby giving the appearance of lifting. Before noon, heat radiated from the warming surface of Earth destroys the inversion and the fog evaporates into the warmed air. Radiation fog is common in high-pressure areas where the wind speed is usually low (less than 5 knots) and clear skies are frequent. These conditions permit maximum radiation cooling. 5-7 AG5f0502 RADIATION LAND COOLING Figure 5-2.Radiation fog.